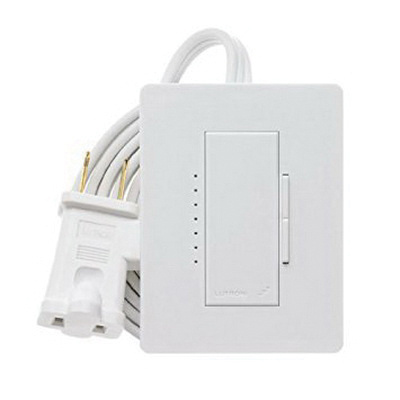 Lutron RadioRA®2 Lamp dimmer has voltage rating of 120-Volts at 50/60-Hz. Dimmer in snow color, provides fade on/fade off, delayed long fade off and rapid full on functions. Dimmer in satin finish, It measures 2-7/16-Inch x 15/16-Inch x 3-1/4-Inch. It allows lights to lights fade ON or OFF on a single-tap and lights go to full ON when double-tapped. Dimmer operates at temperature range of 0 to 40 deg C. Lamp dimmer is UL listed, CSA/NOM certified and FCC approved.